I experienced several more firsts in the week that just flew by. Visited my first Korean palace (Gyeongbokgung). Hailed my first taxi in Seoul and unsuccessfully tried to navigate the driver to my destination (though I was able to at least get him to take me to the correct neighborhood). Saw my first film in a Korean cinema (R2B: Return To Base), a Top Gun-like thriller, with English subtitles. Watched live television from my new Samsung Galaxy S3 phone...on the subway!! Took my first Korean language classes. And visited my new office at Samsung, on the 26th floor of the Samsung Electronics building in Gangnam, for the first time. On Wednesday I went with several of my new colleagues to our first Korean baseball game. Baseball is very popular in Korea...along with golf and soccer it's one of the favorite sports here. Every night this time of year is baseball night in Korea -- you flip channels on TV and you can see three games being broadcast simultaneously. The Korean professional league has 8 teams and we bought tickets to see two of the Seoul teams go head-to-head...the LG Twins vs. the Doosan Bears (all of the teams are named after their corporate sponsors). Lots of LG Twins fans with "thunder sticks"
All we could say was...WOW!! Though the game on the field was identical to that found in the USA, almost everything else about the viewing experience was completely different. You walk off the subway at the Sports Complex station (very convenient to reach from the Samsung office) and are surrounded by tables set up by food vendors. You can buy super-cheap servings of kimbap (seaweed-rice rolls typically wrapped with vegetables and crabmeat), dried squid, kimchi pancakes, delicious fried chicken. You can also purchase inexpensive Korean beers and soju to wash it all down. Thankfully, Korean baseball stadiums let you bring food and drink into the seats, unlike American stadiums which then extort you into buying from outrageously priced concession stands. Korean baseball games are delightfully cheap to attend – 10,000 won (about $9) for a lower grandstand ticket – and the aforementioned cheap food. Definitely a sport for the common man...we didn't see any luxury boxes in the stadium. Once inside the stadium with our food and beer, we saw the stadium neatly segregated into two cheering sections...LG fans along the third base side, Doosan fans on the first base side. Most fans carried "thunder sticks", cylindrical plastic balloons that make a loud clapping noise when struck together. A lot of female fans at the game, too...a higher proportion than you would see at an American baseball game. And CHEERLEADERS!!! Oh my gosh. Amazing. Built into each side was a concrete platform where the female cheerleaders would trot out in their skirts and pump up the fans with their dance moves. Then a man, who I would call an "M.C. ", would walk on the platform, microphone in hand, and lead the team's fans (along with a drum master) in a long series of rhythmic chants and songs. Simply unlike anything you see at an American baseball game. More like a college football atmosphere. Fans going nuts from the first pitch. Batter hits a single, fans go berserk! The Korean baseball players that make the MLB must find American fans to be so passive. The rhythms are very catchy – by about the 4th inning I found myself loving the LG Twins...and I'm about to start working for Samsung. And there was a beer-chugging contest between innings, I kid you not! But the strange thing about the cheering was when it stopped. There was simply...silence. The fans would go nuts when the M.C. would tell them to beat their thunder sticks together, then would just sit there. In American baseball games, the fans sit for most of the game, then rise for the big moments. You expect a crescendo of cheers before a big pitch late in the game. But at the Korean baseball game, fans who had been going nuts for three hours were silent in the 9th inning, two outs, two strikes in a close game. Very strange. As my colleague next to me put it, "Koreans really enjoy playing Follow The Leader". I didn't expect cultural realizations at a baseball game, and had just found one. I also got back into the soccer groove this week, playing my first game in 4 months! 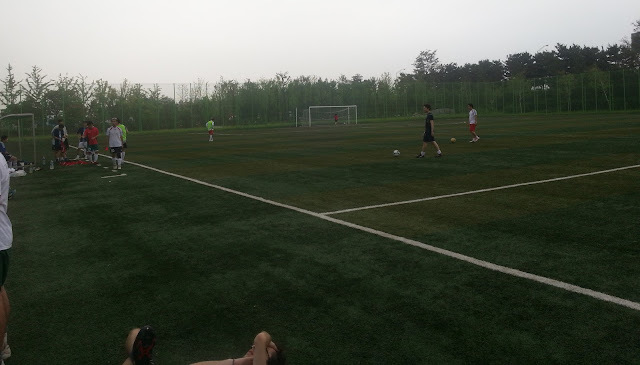 Samsung GSG has a team which plays about one a month against other Samsung companies, and on Saturday morning had a game scheduled with Samsung Fire and Marine Insurance. Crazy start time – 6AM!! In 25 years of playing I had never been on a field so early. We played on a turf field surrounded by a cage next to a freeway in the 'burbs. Felt like something straight out of Germany. Seemed like several members of my team (myself included) were feeling the after effects of a late night out, but other than that I found myself quite in my element on a soccer pitch again. The game was right at my level – decent technical skills, mediocre fitness, and players not taking the game too seriously. Despite the hit to my sleep schedule, I look forward to continuing playing. My new job at Samsung starts tomorrow morning. I will be wearing a suit for the first time in awhile!